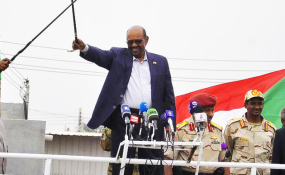 Khartoum — Ambassador Adil Sharafi, former Ambassador of Sudan to Uganda, has described President Omar Al Bashir's decision to reduce Sudanese diplomatic missions as "a result of anger about former Foreign Minister Ibrahim Ghandour". He said in an interview with Radio Dabanga that the decision came without careful study, knowledge regarding the role of these missions, the nature of the work of the Ministry of Foreign Affairs or what returns to Sudan as a result of the efforts of the diplomatic missions. In a presidential decree released on Wednesday evening, President Omar Al Bashir ordered the closure of 13 embassies and four consulates. On April 19, President Al Bashir dismissed Finance Minister Ibrahim Ghandour, a day after the minister accused the Central Bank of Sudan of not releasing the salaries for diplomats abroad for seven months. Ambassador Sharafi explained that Ministry of Foreign Affairs has not participated nor been consulted in the decision. He said not only did the decision reduce diplomatic missions but also included the cancellation of some of the former foreign minister Ghandour's decisions. He added that the return of these missions is much higher than the $32 million that the Bank of Sudan has reportedly failed to transfer to the Foreign Ministry. He summed it all up as "a structural crisis in the Sudanese foreign policy in the first place". Sharafi said that the external funding crisis is a corruption crisis and not resources because Sudan's resources are sufficient for a larger foreign ministry. He explained that the Ministry of Foreign Affairs has its problems and many missions are unable to perform their tasks. "There are many unqualified cadres that came through the policy of empowerment and the preoccupation of the missions with things that have nothing to do with the diplomatic work." He told Radio Dabanga that the cancellation of such a number of missions has implications and that their continuation will benefit more than the amount necessary for their operation, referring to what is known as development diplomacy, which results in many forms of technical cooperation, health and education protocols, training and development assistance, this in addition to attracting investments from big companies and large projects, all of which are unforeseen roles for many. Ambassador Sharafi ruled out that these decisions would have a major role or reaction in the face of the regime because the Ministry of Foreign Affairs alone cannot make any changes, but the ministry staff may work to mitigate the effects of the decision to raise some recommendations with facts that were absent from the decision-making centres. Last week President Omar Al Bashir issued a decision to close 13 embassies and four consulates and approve the one-man mission in seven missions for spending rationalisation. The closed embassies in Europe include Austria, Ireland, Hungary, Bulgaria, Romania, and Czech Republic, while the closed missions in Africa include Tanzania, Angola, Burkina Faso and two in Asia, Vietnam, Azerbaijan, this in addition to the Embassy of Sudan in Australia which was opened on February 19. The decision to close four consulates is Alexandria in Egypt, Erbil in Iraq, Benghazi in Libya, and Gulu in Uganda. With regard to the one-man missions, sources confirmed the adoption of single ambassadors in Canada, Sweden, Mozambique, Ghana, and Zimbabwe, and in Yemen until the end of the war.